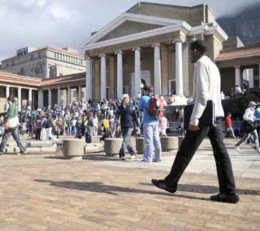 UCT aspires to become a premier academic meeting point between South Africa, the rest of Africa and the world. Taking advantage of expanding global networks and our distinct vantage point in Africa, we are committed, through innovative research and scholarship, to grapple with the key issues of our natural and social worlds. We aim to produce graduates whose qualifications are internationally recognised and locally applicable, underpinned by values of engaged citizenship and social justice. UCT will promote diversity and tranformation within our institution and beyond, including growing the next generation of academics.